The beginning of my love for vegetarian delicacies in buffalo sauce can be tracked to these Thug Kitchen buffalo falafel. They opened up my world of buffalo things so far beyond wings. 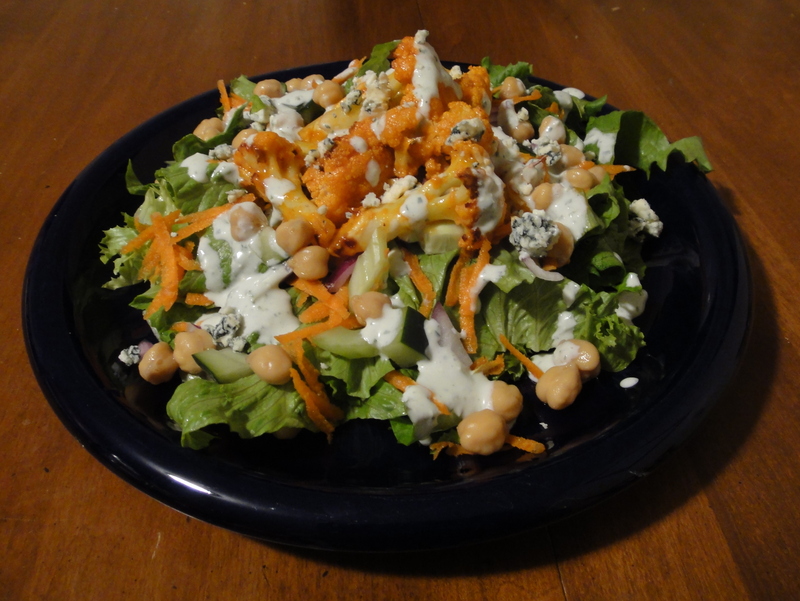 Those falafel were essentially deconstructed to make this recipe for buffalo cauliflower salad (which would also be excellent with the falafel on top if you’re willing to do a bit more work). From there the logical next step is obviously pizza. We were grocery shopping with a vague plan for dinner and Will had the genius idea for this pizza. The first try I put too much butter in the sauce, which made for a soggier pizza but the flavor was everything we hoped for. This version hits all the right notes, with a spicy (less runny) sauce, creamy cheeses, enough vegetables to make this an acceptable adult dinner, and a fresh bite of onion at the end. Preheat the oven to 425F. Slice the cauliflower in half and cut out the core. Cut the head into 1 inch pieces (bite-sized). Toss the cauliflower in the olive oil and a few pinches of salt, and spread evenly on 1 or 2 baking sheets (you want space between the pieces so they brown). Roast for 25-30 minutes, tossing once, until the cauliflower is soft all the way through and has some charred spots. When the cauliflower comes out of the oven crank up the heat to 500F. Melt the butter, add the hot sauce, and stir to combine. Spread your pizza dough out on 2 baking sheets (the recipe linked to makes for a very moist dough that I find easiest to spread on a silicone baking mat). Put the cauliflower in a bowl and pour ¼ cup of the hot sauce and butter mixture over it. Toss the cauliflower to coat. Spread the remaining hot sauce mixture evenly over the doughs. Then evenly distribute the rest of the items in this order: kale, cauliflower, bleu cheese crumbles, and shredded mozzarella. Bake for 10 minutes, or until the bottom pulls away from the pan and the cheese is bubbling vigorously. 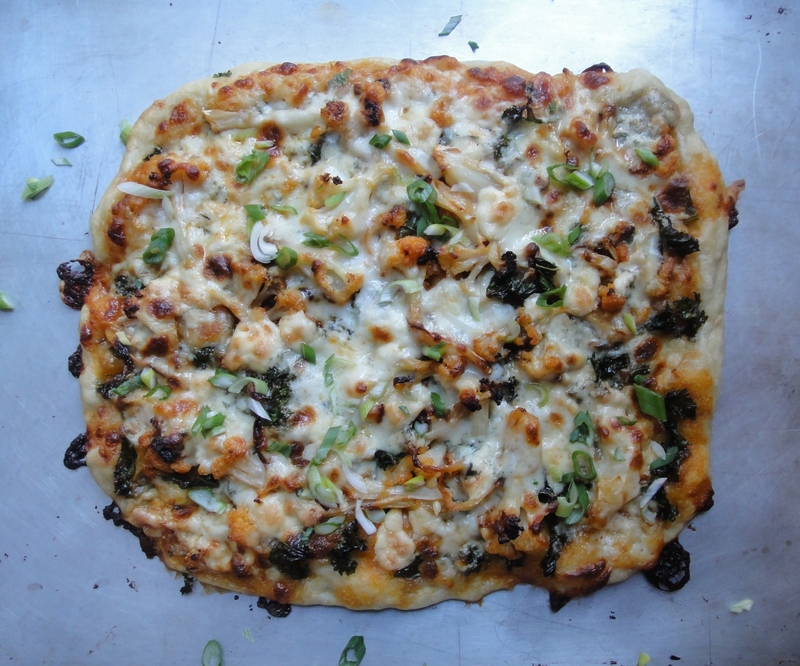 Let cool for a couple minutes, then sprinkle the scallions on top and serve.